Enjoy living the lakeside lifestyle in this charming 6 bedroom walk-out bungalow in a quiet cul-de-sac on Chestermere Lake! The design of this home provides a relaxing and gorgeous view of the lake and Rocky Mountains. This is an open concept home with high vaulted ceilings throughout. The main floor features a warm and relaxing family room with a stone fireplace, lovely open kitchen with conversation ledge, wall oven, gas stove, eating nook with a beautiful view of the lake, separate dining room and main floor laundry. It also features an oversized master suite with his/her closets and an ensuite with a corner jetted tub, 2 sinks, separate shower and a sitting area overlooking the lake. Two additional well sized bedrooms on the main floor. This incredible home also features a second kitchen facility in the lower w/out bsmnt along with a large family room with a built-in wall unit a second fireplace, pool table area, entertainment center as well as 3 additional bedrooms. The backyard offers vinyl fencing and is fully landscaped with a stamped concrete patio, gazebo, and maintenance free dock. Oversized 22’x40’ front attached garage.This home has to be seen to be truly appreciated. 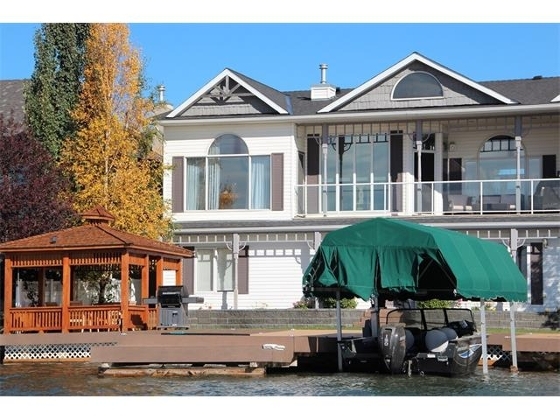 View this home at http://househuntingadventures.com/mylistings.html/listing.c4036780-1089-east-chestermere-drive-chestermere-t1x-1a9.52550193#viewtop and call for an appointment to view.